Technically we are once again approaching that dangerous level on the dollar yen chart as the price action moves towards the 88.00 price point , which triggered the previous intervention from the Bank of Japan to prevent the Japanese yen strengthening further thereby damaging its otherwise fragile economy and jeopardizing any recovery from the deep recession of the last few months. Whilst many commentators have suggested that 85 is the pain threshold for the BOJ, my own view is that the 88 level is more likely, and as a result we may see a bounce higher from this point once again in the short term. 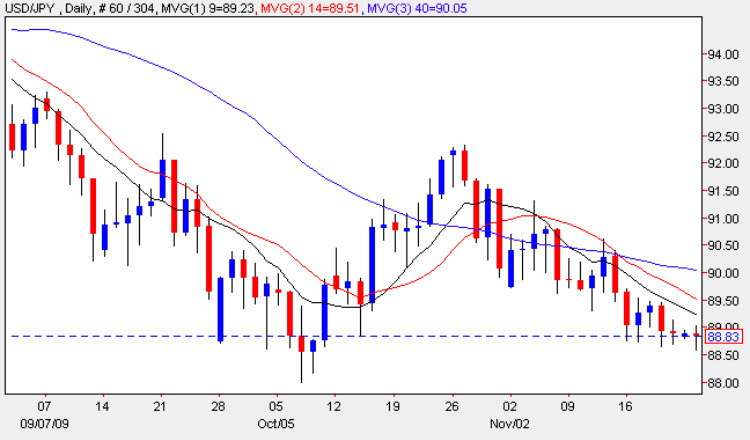 With all three moving averages now weighing heavily on the dollar yen pair, the current sentiment is heavily bearish, increasing the likelihood of some form of intervention from the BOJ, and as a result we could see a sharp move higher in due course, possibly to retest the earlier level of 92.50 in the medium term as a result. With a national holiday in Japan the market will be looking at the US Existing Home Sales which are expected to come in 5.71m.